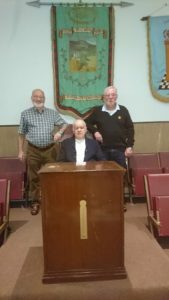 On the 28th June 2018 a large deputation from the Provincial Grand Lodge of Lanarkshire Middle Ward, headed by Provincial Grand Master Bro. 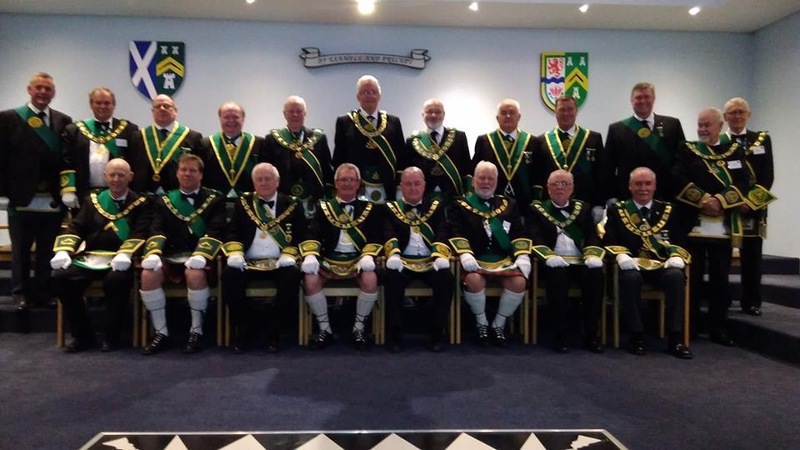 Bill Perry and accompanied by The Provincial Grand Master of Stirlingshire Bro. 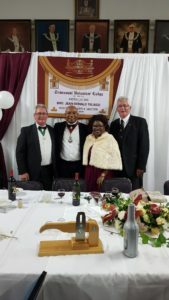 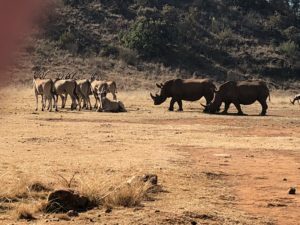 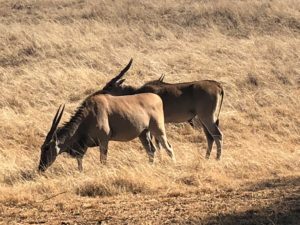 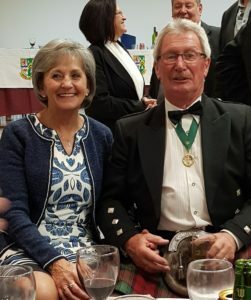 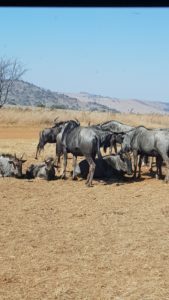 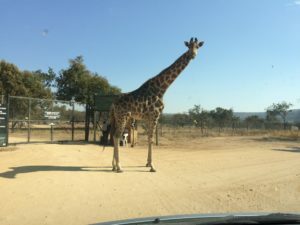 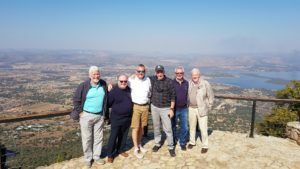 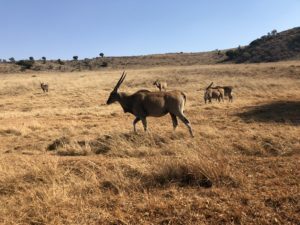 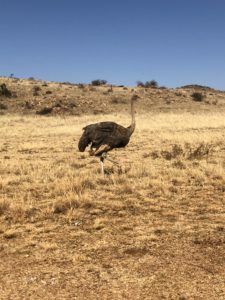 Alistair Marshall, made a trip to Johannesburg, South Africa to cement the official Twinning of the Provincial Grand Lodge of Lanarkshire Middle Ward and the District Grand Lodge of Central South Africa. 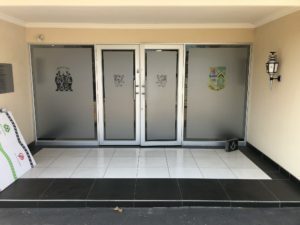 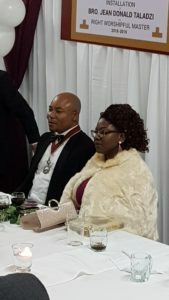 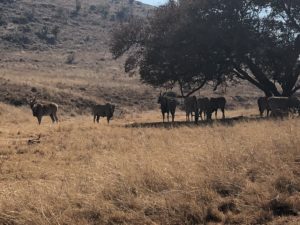 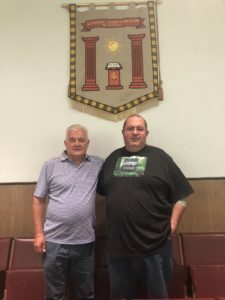 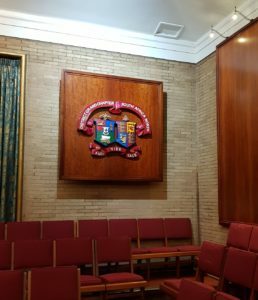 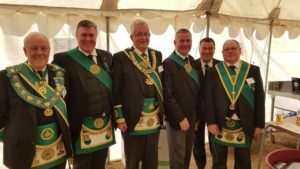 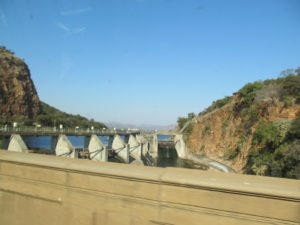 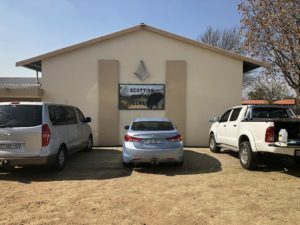 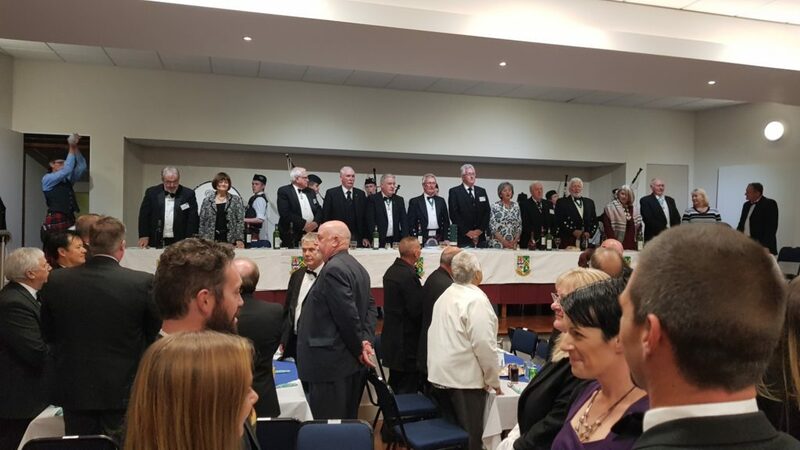 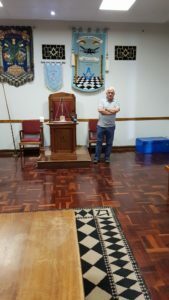 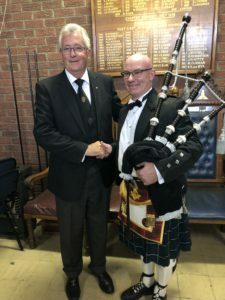 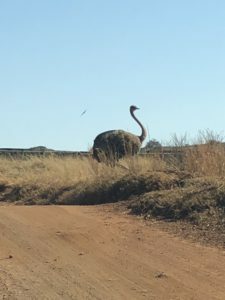 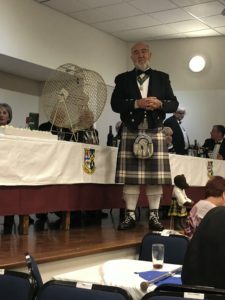 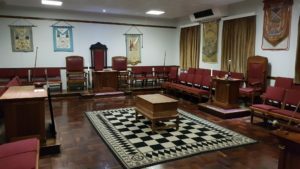 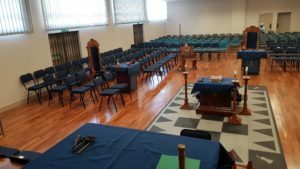 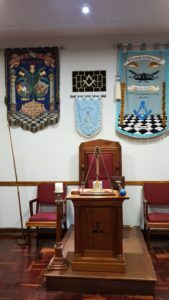 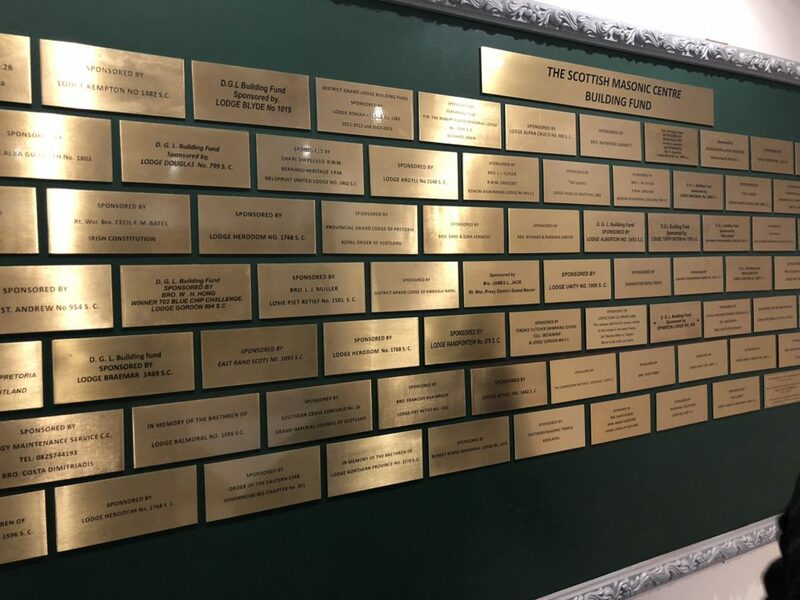 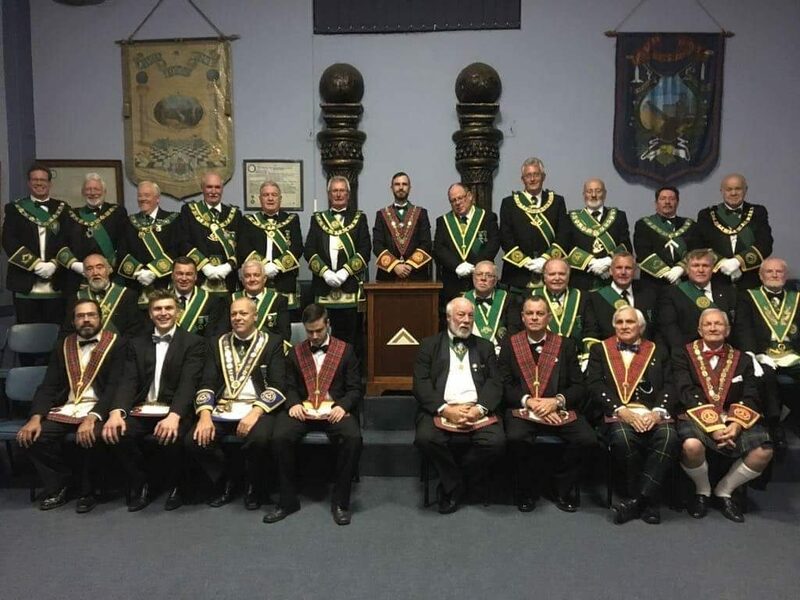 The Scottish Masonic Centre situated in the Province of Germiston in the outskirts of Johannesburg was the venue for the regular communication of the District Grand Lodge of Central South Africa. 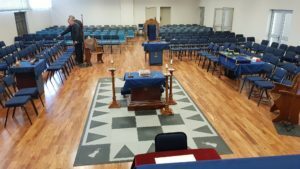 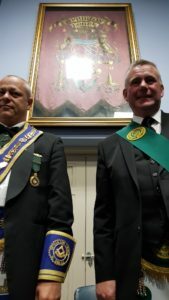 Provincial Grand Master Bill Perry and his deputation arrived early in the morning for the 2pm ceremony, it was clear that a great deal of planning had gone in by District Grand Master Bro. 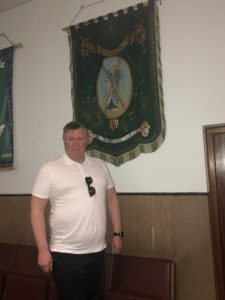 Jim Kerr and the Brethren of the District, final rehearsals were taking place, led from the front by Bro. 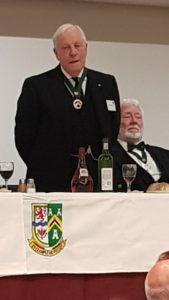 James L. Jack, Past Provincial Grand Master and Bro. 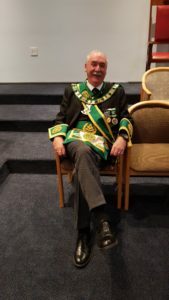 George Kelly Past Provincial Grand Master, Past Substitute Grand Master. 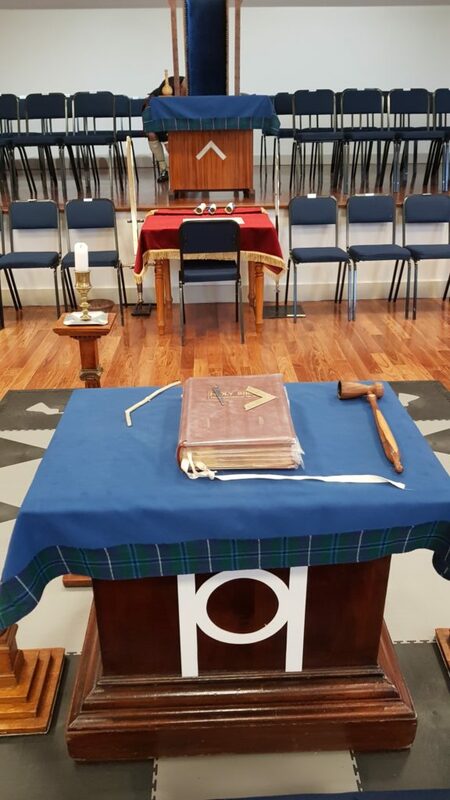 The Scottish Masonic Centre is a large modern exclusive building on equally large grounds, wholly owned by the Brethren of the District, it has various temples and function suites including the official offices of District Grand Lodge. 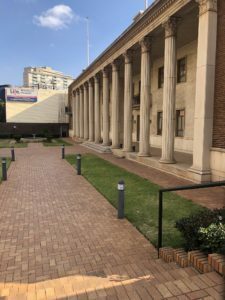 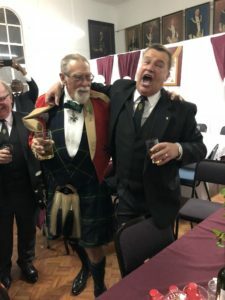 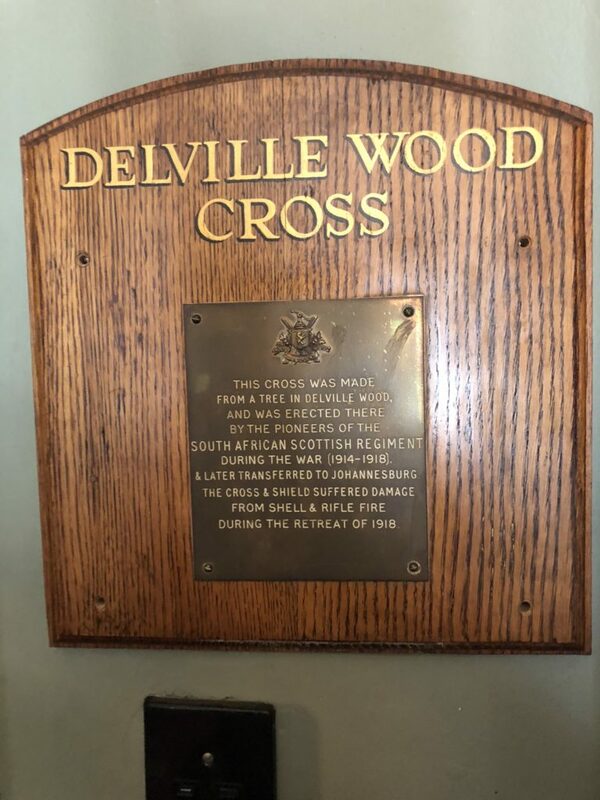 The main hall where the ceremony was to take place had seating from over 300 Brethren, on the day an external marque was setup as a temporary bar area, a facility that was a blessing to the 10 travelling Scotsmen in the midday sun of Johannesburg, it was soon put to some good use. 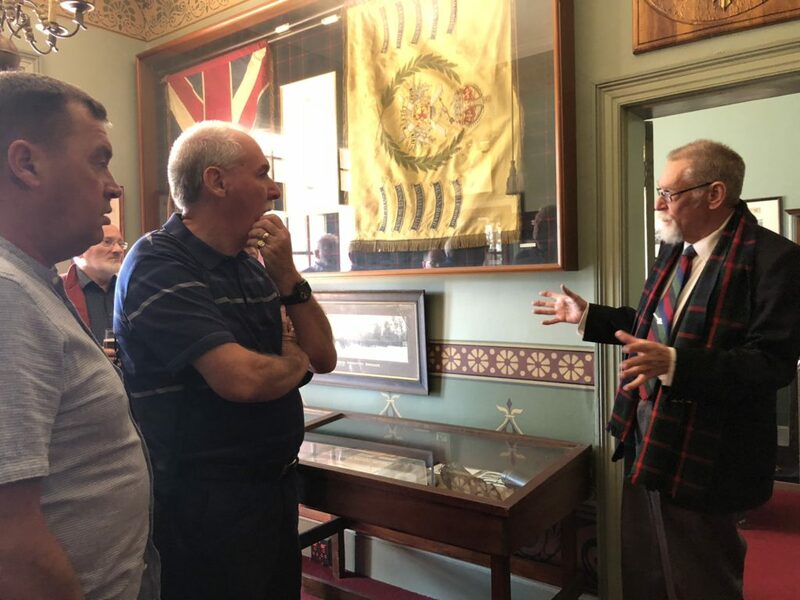 The communication was opened promptly at 2pm and the official deputations received. 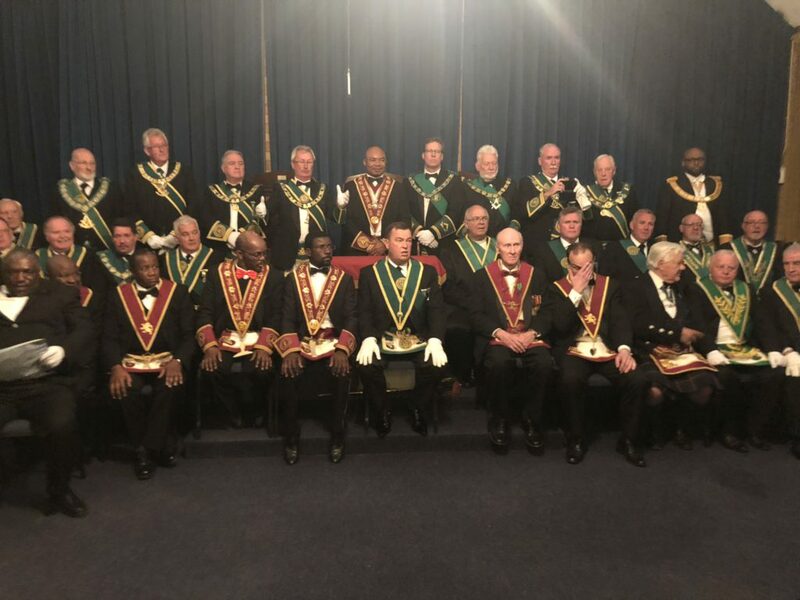 As well as the Provincial and District Grand Lodge deputations it was pleasing to note that deputations were also received from the Grand Lodge of England, Ireland & South Africa , following the deputations being received and introduced, each of the Lodges present were introduced and members asked to stand and salute the District Grand Master, there was also an opportunity for the Proxy Masters present from the Middle Ward to be introduced to the assembled Brethren individually. 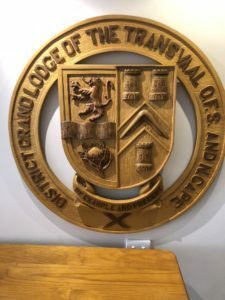 Following the official business of District Grand Lodge, Bro. 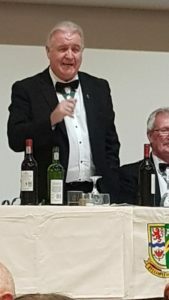 George Kelly was asked to preside over the Lodge and conduct the Twinning Ceremony, this he did in his usual expert style. 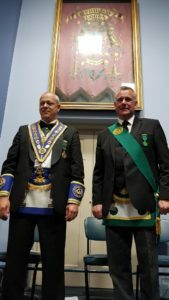 assisted by acting Director of Ceremonies Bro. 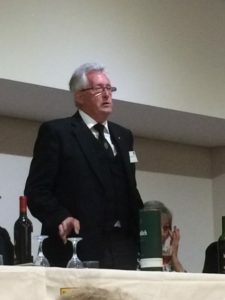 James L. Jack. 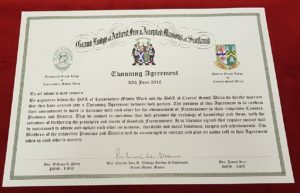 At the appropriate moment in the ceremony both the District Grand Master and Provincial Grand Master were asked to come from the East and sign the Twinning documents, prior to travelling to South Africa these had been signed by the Grand Master Mason, giving his approval of the ceremony. 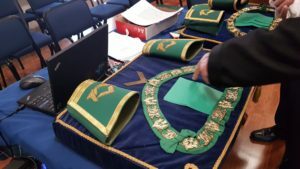 These documents will be retained by the DGL & PGL and displayed proudly in the appropriate places. 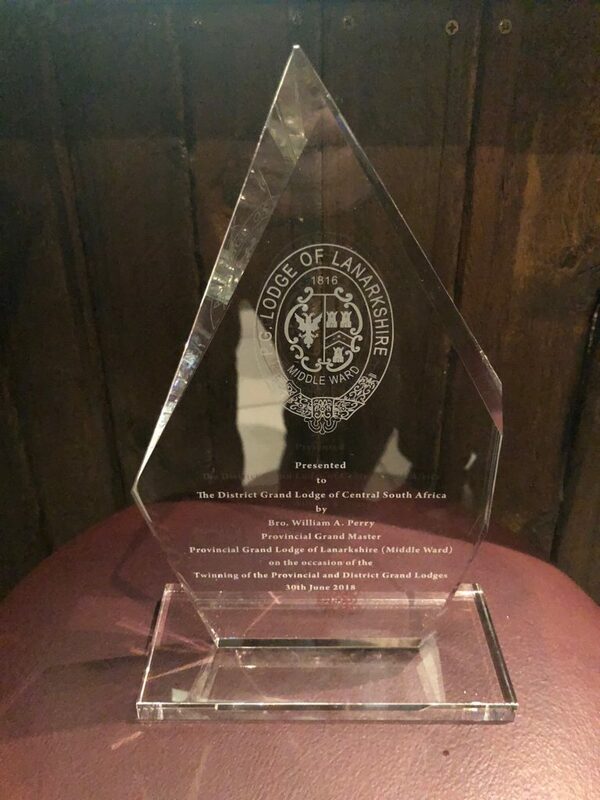 PGM Bill Perry has also arranged that all the PGL of Lanarkshire Middle Ward Lodges represented at the Ceremony are to receive a copy of the document for display in their own Mother Lodge. 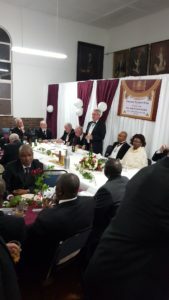 Bro James Kerr District Grand Master proceeded to present Bro. 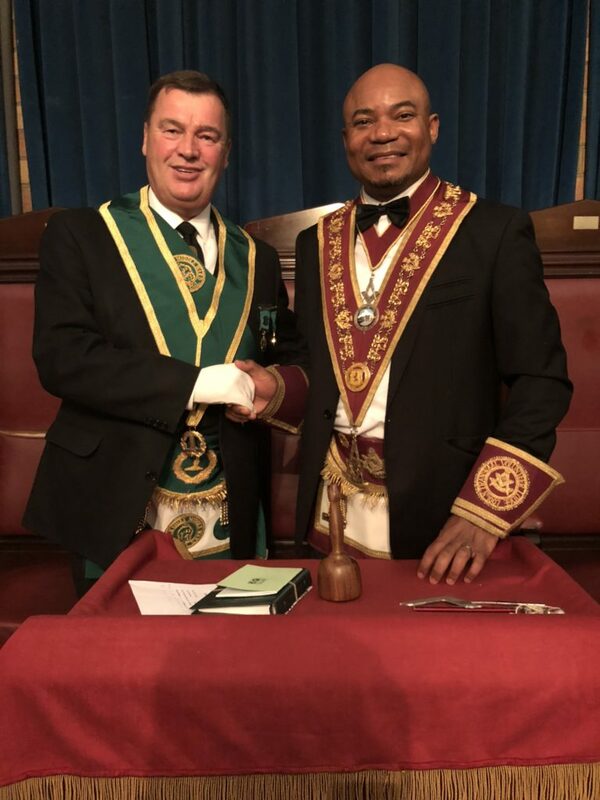 Bill Perry PGM with Honorary Membership of the District Grand Lodge of Central South Africa which he was delighted to accept, following this the sentiment was reciprocated with Bro. 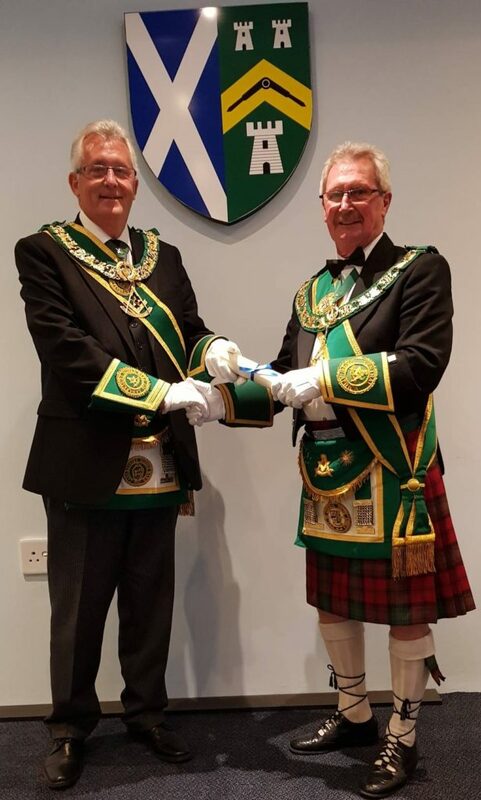 Jim Kerr receiving Honorary Membership of the Provincial Grand Lodge of Lanarkshire Middle Ward, also at this point Bro. 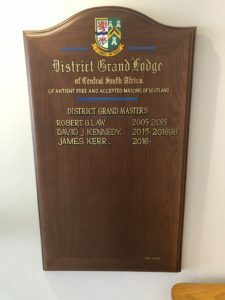 Perry presented the District Grand Lodge with glass engraved plaque to mark this historic occasion between them. 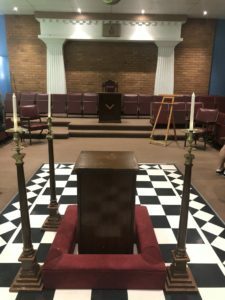 At the conclusion of the Communication Bro. 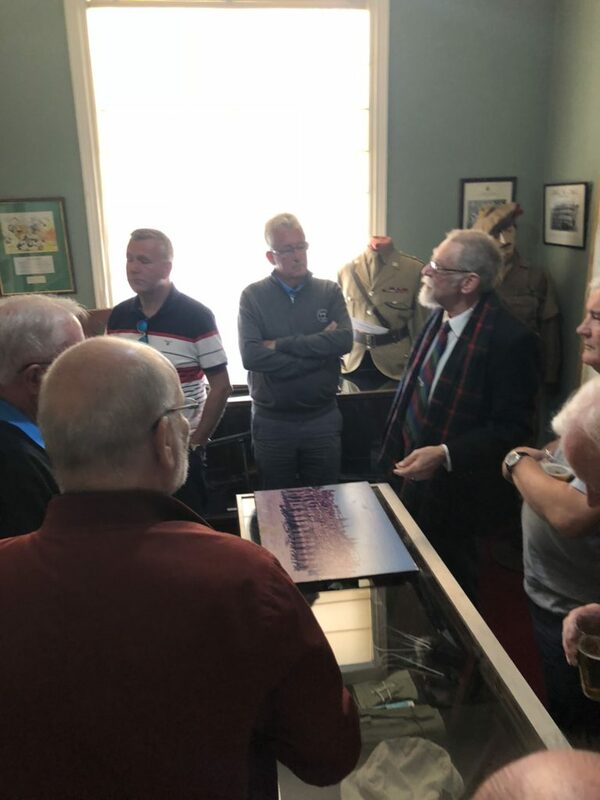 Jim Kerr also presented all the visiting Proxy Masters from Scotland with a personalised copy of local book with a individually signed letter thanking them for their visit to Johannesburg and their ongoing support. 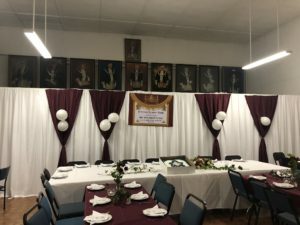 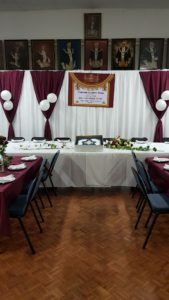 The deputations were then invited to retire and the Communication closed where the main hall was setup for the banquet and harmony to follow. 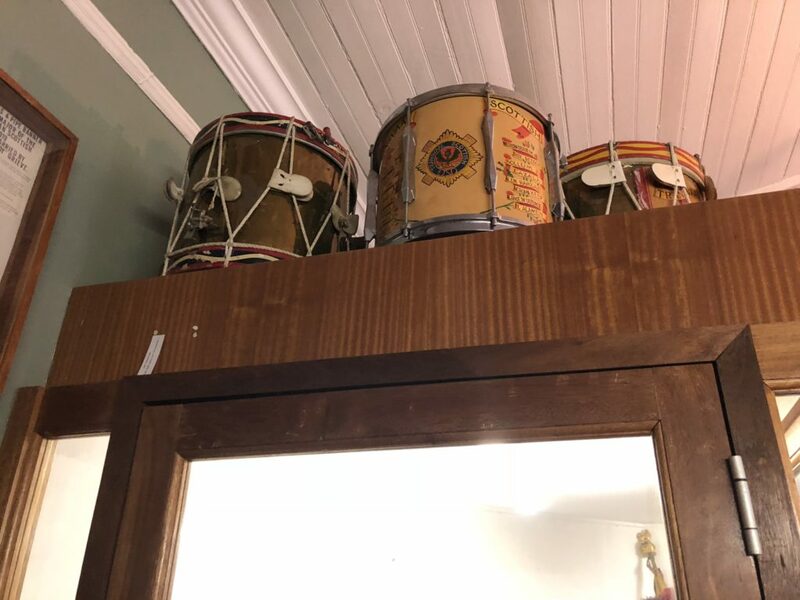 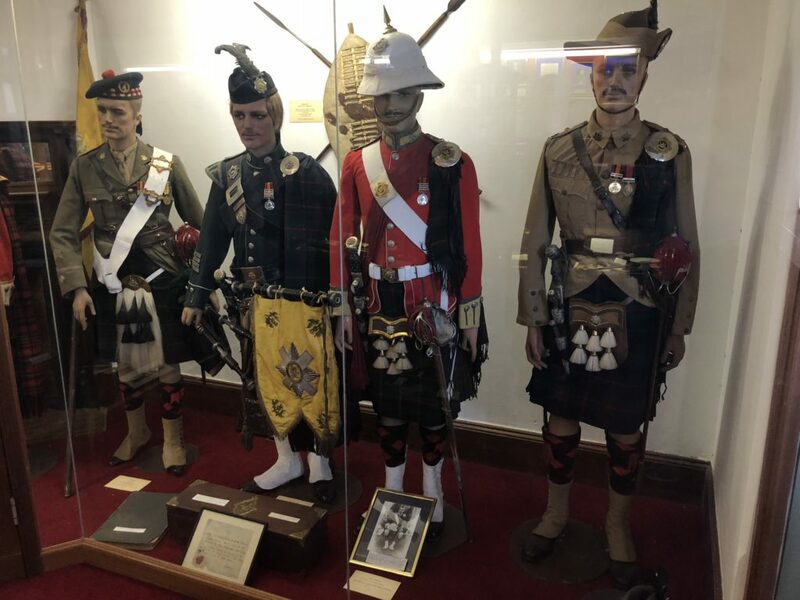 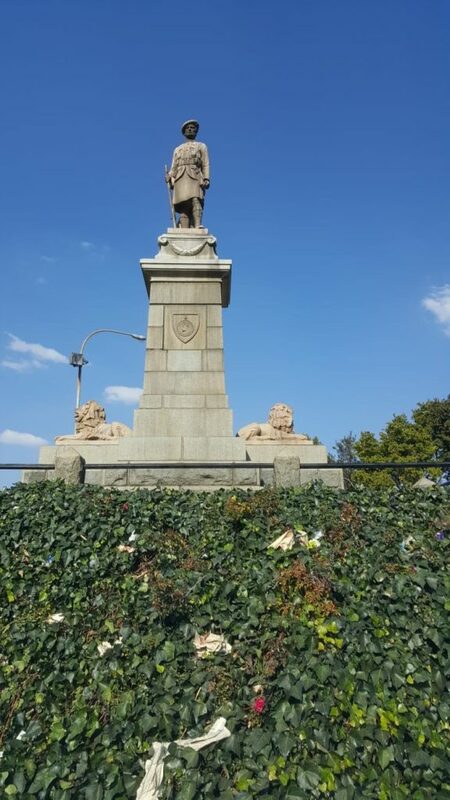 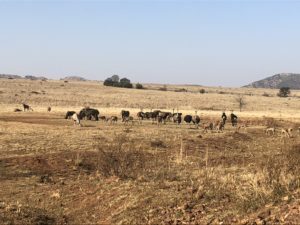 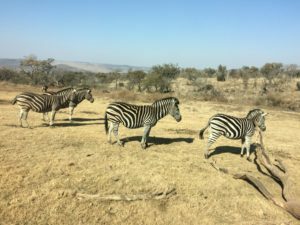 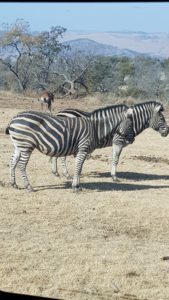 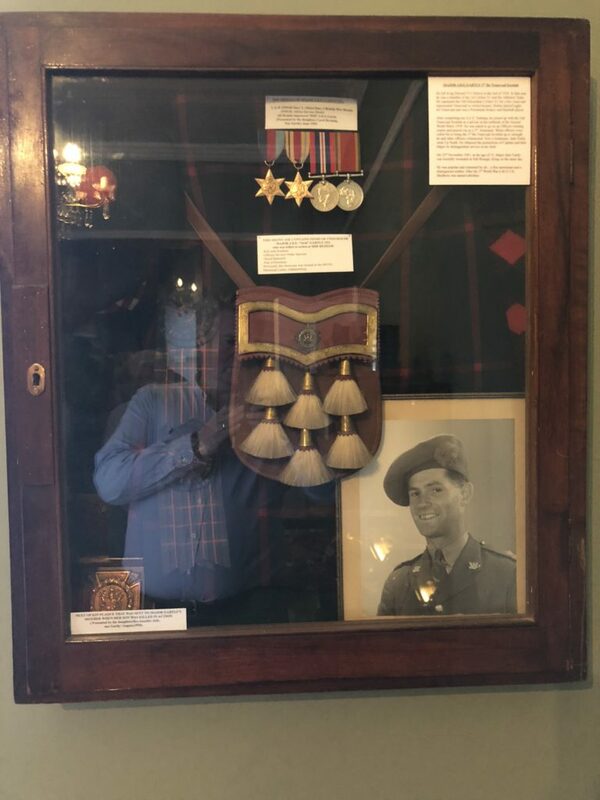 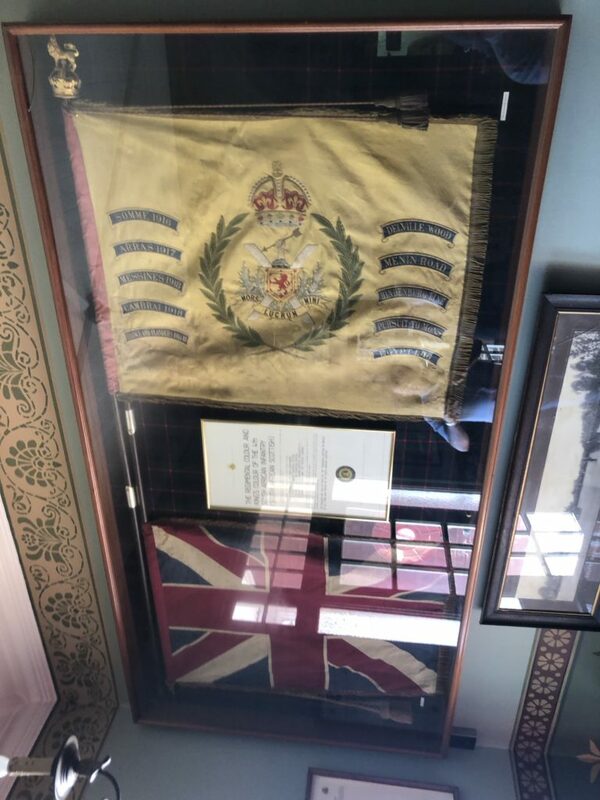 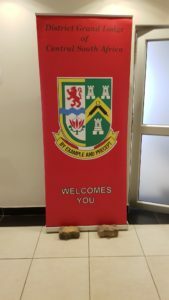 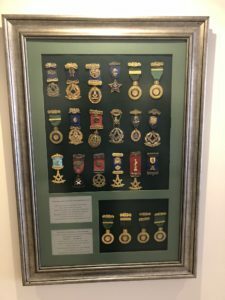 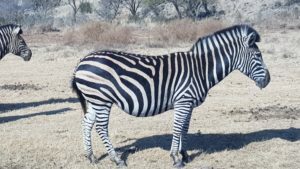 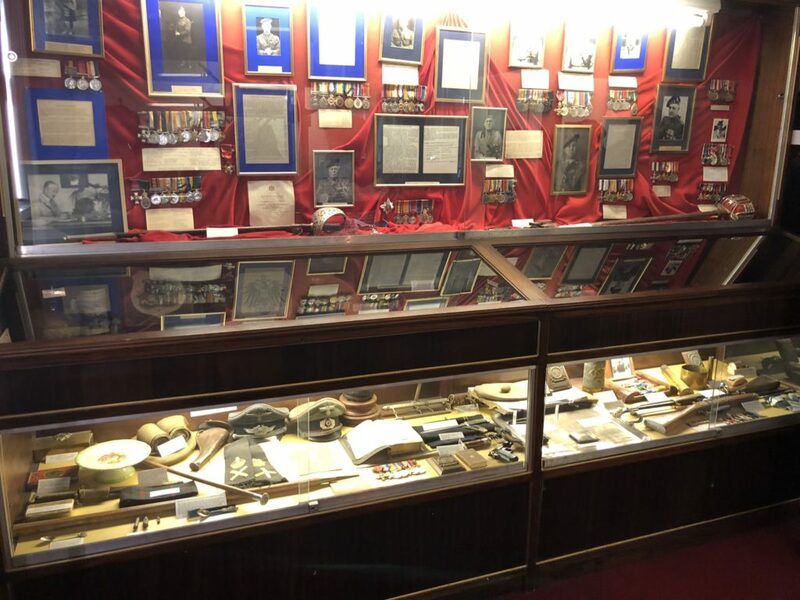 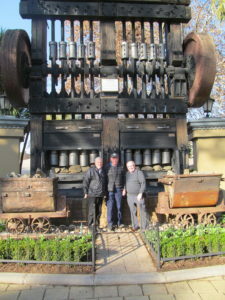 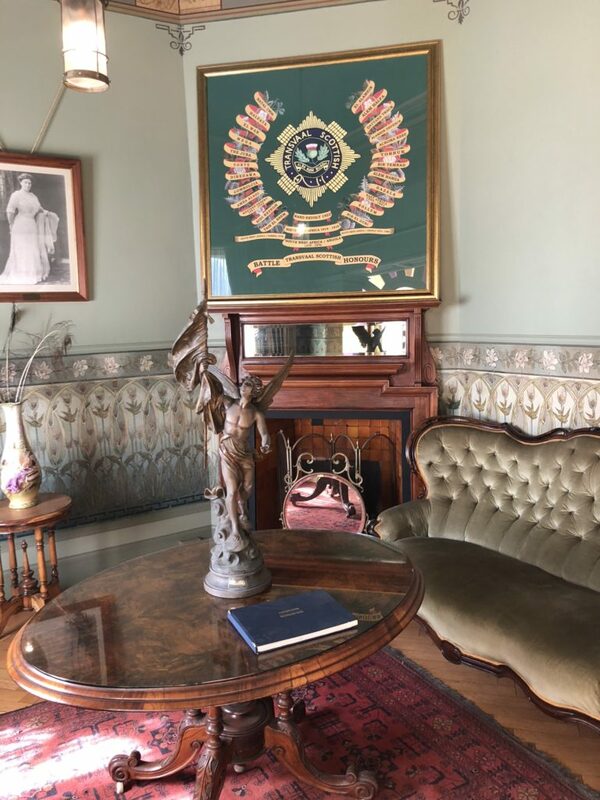 The visit to South Africa was kicked of with a visit to the Transvaal Volunteers museum “The View”, the home of one of South Africa’s most famous regiments, the Transvaal Scottish, or, as they are less formally known, ‘The Jocks’. 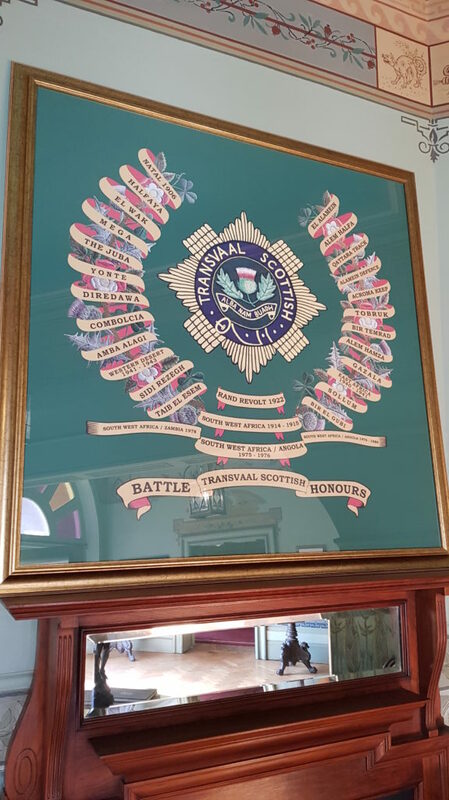 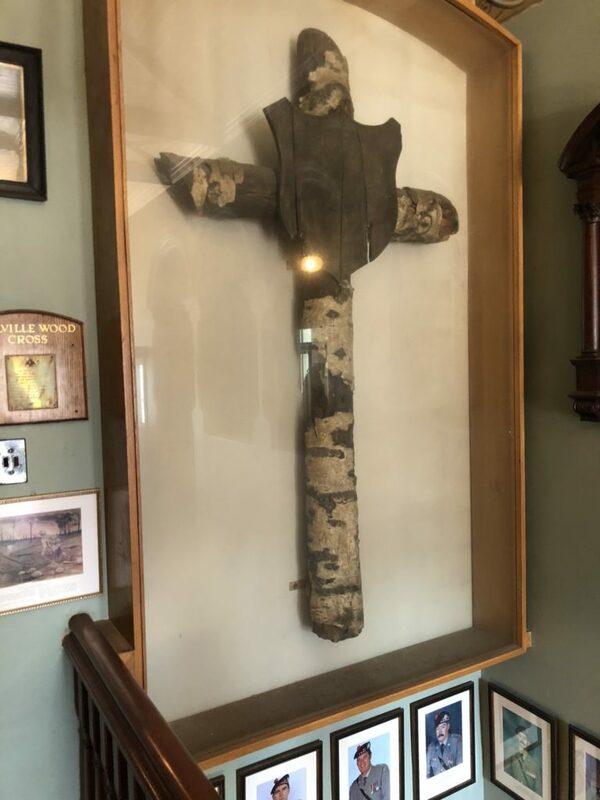 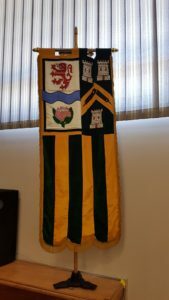 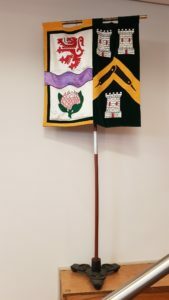 In 1976 the Transvaal Scottish Regimental Council acquired ‘The View’ on a long term lease as a headquarters for the regimental family of the Transvaal Scottish, including Council, Association, members of the Regiment and friends, and to house a regimental museum. 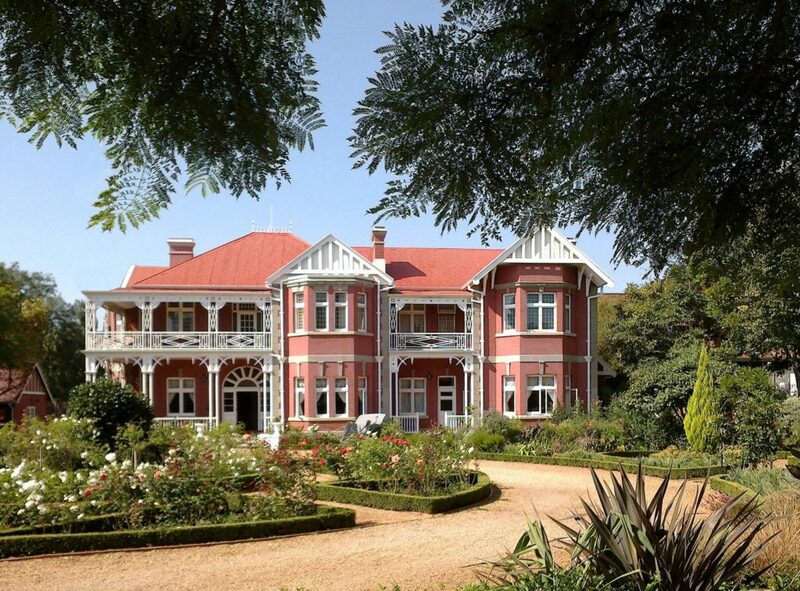 The beautiful old house in Ridge Road, Parktown, which for many years was the home of the mining magnate, Sir Thomas Cullinan and his family, and host to royalty when visiting the city of Johannesburg. 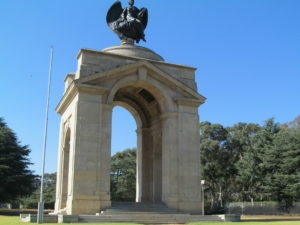 It is now dwarfed by the huge developments that have engulfed the suburb. 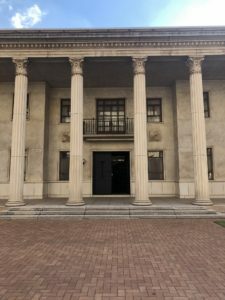 Yet it stands as a proud legacy of South Africa’s past and this has been acknowledged by the Lottery Commission, which made a large grant towards the restoration of the fine old house as a part of civic heritage. 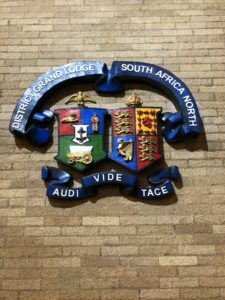 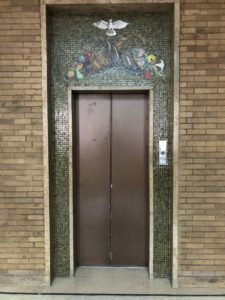 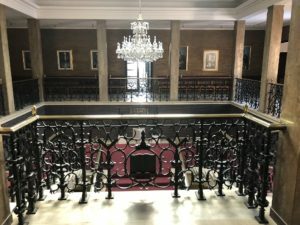 Following the visit to “The View” the Brethren was shown The Grand Lodge of England Temple in downtown Johannesburg, this building was constructed in are area where in the 60/70 was a vert affluent area, the building was a magnificent structure and very well kept, from the pictures below I’m sure you will agree.